I was in the mood for hibachi. Recently, I was looking at Google Maps and found Benihana in midtown and thought, “Wow, I haven’t been there in a long time, let’s go.” Then, I learned there would be crowds. Then, I learned there would be no reservations available. So, I began a quest to find decent hibachi somewhere else. And I certainly found it. 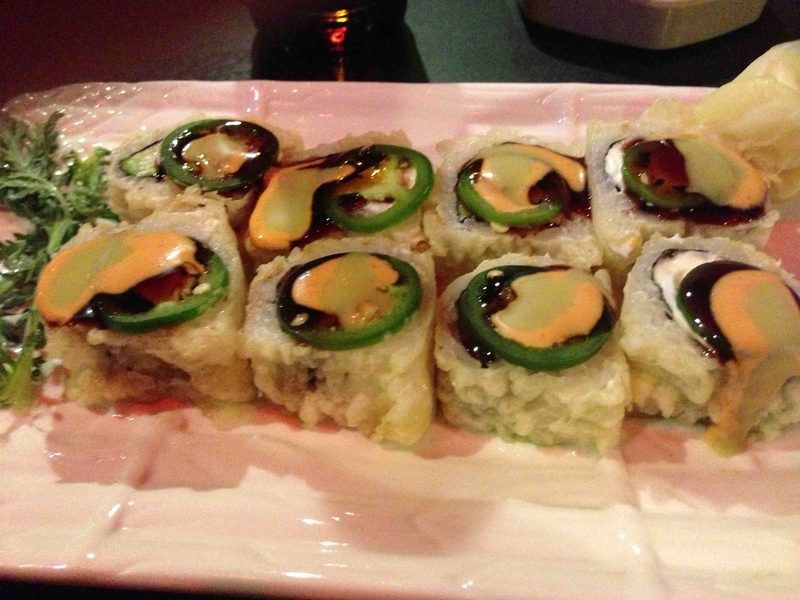 Located in Forest Hills near the 75th Avenue subway stop, Midori Matsu is hard to miss. A huge sign that reads “HIBACHI” hangs overhead as you walk into the establishment. Upon entering, you find a room with hardly anyone in it except for someone who’s making sushi. Then, you’re asked if you want hibachi. At that point, you’re escorted into a larger room with approximately six hibachi set-ups. And you’re delighted to be there. MDP and I were quite hungry, as I hadn’t eaten much for breakfast that day, so we went whole hog and got dumplings, sushi and hibachi for each of us. The gyoza, or vegetable dumplings, were very green and filled with vegetables such as edamame. I scarfed down three of them within a few minutes and felt pretty sated. MDP liked them also. We ordered the Las Vegas roll sushi, which was salmon with avocado, cream cheese, jalapeno and some kind of sauce on top. I enjoyed it, but MDP especially liked it. The jalapeno really added a certain kick to the end of the eating experience. Now, for the hibachi. I ordered the steak and chicken hibachi, while MDP got teriyaki chicken. We were served an onion soup and a salad with that delicious orange dressing on it, alongside our hibachi. The hibachi chef came out and immediately put on a show. He threw his utensils around and made clanging noises, so loud that the child sitting at our table began to cry. He began by making shrimp for all of us, and put a bunch of rice on the hot surface to later make fried rice. He also put a medley of vegetables on the cooking surface that would later accompany our foods. 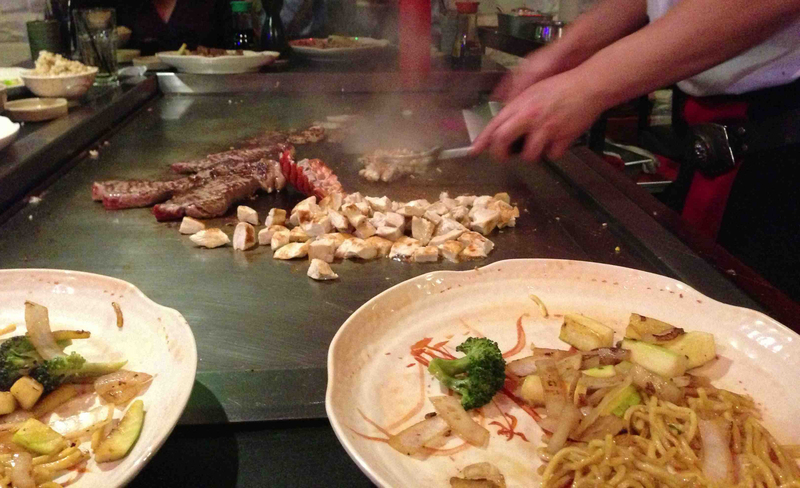 A delight to watch, the hibachi chef created an onion “volcano” by lighting on fire a few rings of an onion. This terrified the young girl at our table. She put her hands over her ears and started to cry. He said, “That’s okay. The volcano won’t hurt you.” But she persisted. My steak turned out perfect and the chicken was quite good also. The chef gave us some dipping sauces, which were, I think, mustard and ginger, respectively. They were a nice accent to the food. MDP’s teriyaki chicken was quite good, as well. It was thickly flavorful. All and all, Midori Matsu is well worth the hike. And it’s great for groups if you get there early on a Saturday night, like we did. 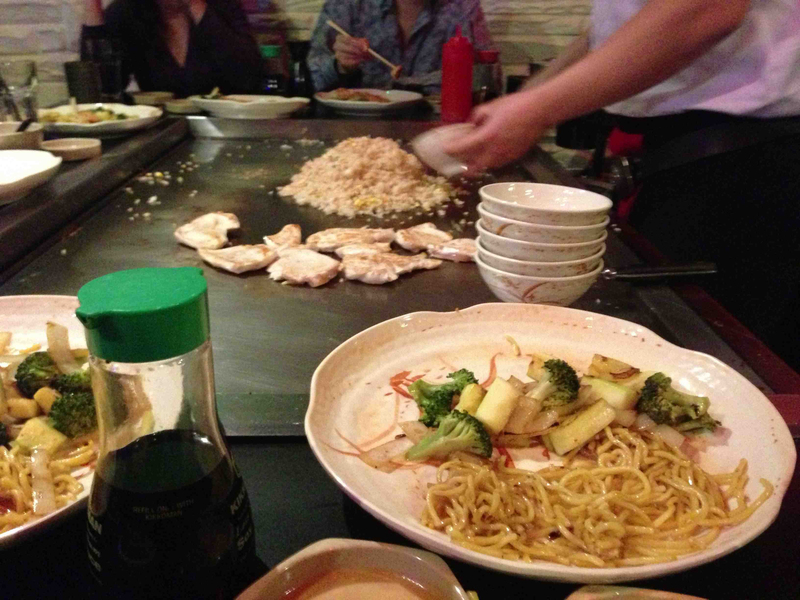 The hibachi chefs all seemed quite entertaining, so you’re certain to have a good show whenever you decide to go. Take the E/F to 75th Avenue. It’s a few steps away from the subway entrance on the south side of Queens Boulevard.